I haven’t used Google Scholar in a while, but just popped in and noticed a few new features. There’s now a distinct patent search, as well as an option to search legal opinions and journals, and a link to a search function for (presumably) statutes & regulations. I’d be interested to hear from law and business librarians–how well do these work? Thanks to Peter Gunn for passing along this live-blog of Apple’s unveiling of its new iPad (long called “The Tablet” by speculating tech reporters.) Interesting to see that right away, they have a color display and full Web access…unlike the Kindle. 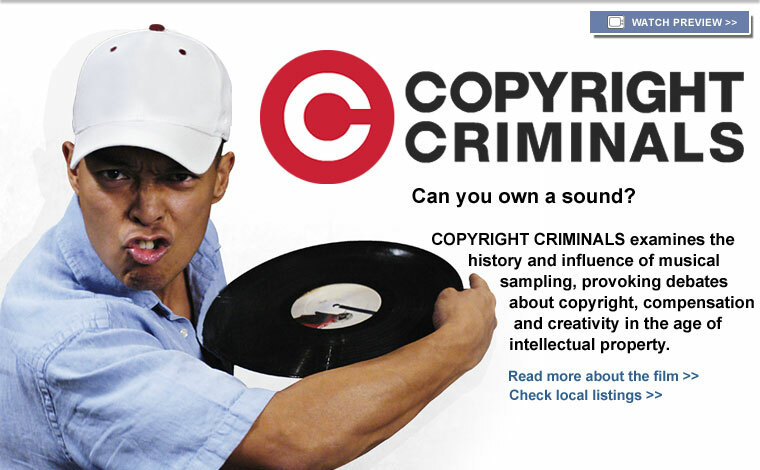 Copyright Criminals, the independent documentary we screened at the University of Oregon Portland Library & Learning Commons last year, is now showing on PBS’s Independent Lens. You can watch a preview if you click that link. And you can see photos from our post-screening Q&A with Gang of Four bassist Dave Allen here. Congratulations to filmmakers Kembrew McLeod and Ben Franzen! One of the winners of the prize in 2009 was the Perry Branch of the Maricopa County Library District, which did away with Dewey and shelved its books in browsable “neighborhoods,” the way bookstores do. Circulation rates are way up, and customer feedback has been great. I can’t say this idea hasn’t occurred to me many times–if only we could make our library look more like a really awesome, welcoming bookstore! I love hearing about a library that’s actually done it. Well, that makes me sound like an authority, when in fact I’m just a librarian with a Kindle. Is that authority enough? I recently got a Kindle 2, and by now the experience of reading on it has settled in enough that I feel like I can make say a few things about it. I’m going to talk about the device itself here, not about the business, intellectual property, or other implications it may have for publishers, authors, readers, and librarians. Obviously there’s plenty to say there, but in the interests of brevity I’ll save that for another post. To advance through the text (newspeak for “turn pages”), you click buttons on the sides of the body. These are reportedly better-positioned than in the last version of the device–hooray. But they still don’t feel very 2010. They actually click in, like the click-button on your laptop. They make a clicking noise. A little one, but still. This immediately makes me think two things: 1.) these buttons will break. And 2.) why the heck would you make a click-button when you could make a silent soft-pad button or a mousepad area? Why do you want the reader to have to hear a “click” every time she progresses through the book? Why does her sleeping partner have to hear that? It’s a little feature, but we’re talking features, so. Why the “click”, Amazon? For that matter, you navigate through menus with a toggle button that also feels vulnerable to near-immediate breakage. (And also feels very retro–don’t we have better hardware interfaces by now? Don’t we have scroll wheels, for instance?) In general, while the buttons may be improved from the first version of the device, I’m not super impressed with the masterful engineering that led us to…a little plastic toggle and a “back” button. We all know it’s e-ink by now, right? It’s not backlit, which is good from one point of view: I already spend too many hours a day staring at screens, and who needs more eye fatigue? But there’s also no option to backlight, which seems like a missed opportunity. I know, I know–Amazon wanted to keep the device streamlined and (reasonably) affordable. But if you’re going to build a digital reading device, wouldn’t you want to make it possible for users to read in low or no light? Doesn’t that seem like a natural feature to offer? Also: the screen is black-and-white, and while Amazon preloads some pretty rotating pictures that show up when the device is asleep, the resolution is no great shakes. You can resize the font by a factor of three or four. You can’t, as far as I can tell, change the font. One drawback of this fluidity is that if you remember something you read, oh, about six pages back, you can’t just rifle back through the pages to find it. You have to go back click by click (there’s that clicky button again, waiting to break) until you recover it–unless you can remember a keyword, in which case you can zip there pretty fast by clicking a button, navigating a menu, typing in your word, clicking a button, and waiting for the processor to respond… Any way you slice it, it’s a different kinesthetic and conceptual experience from paging through a book. One of the big deals about Kindle 2 is that it will read to you. (But then again, so will Adobe Reader.) The text-to-voice feature offers a male or female voice, and you can speed up or slow down the pace of reading. The QUALitEE ofthe READinG is SORT OFLIKE tHIS. If you’ve ever used an automated text-to-voice program, you pretty much get it. There is a jack for headphones. A colleague of mine loves this feature–she has a long driving commute, and she can set her Kindle on the passenger seat, turn up the volume, and it will happily read aloud to her all the way home. You can highlight passages of text by using the little toggle button, add notes with the teeny keyboard, and call up definitions from the New Oxford American Dictionary, which is included in the device. Your notes and highlights are stored on a kind of clipboard, so you can return to them at any time. If you turn Whispernet on you can access the Internet–kinda. By poking around a little you can find your way onto Wikipedia (already mapped for you) and if you poke further you can sort of get to the Internet to check your email…but it’s like using tinfoil and rabbit ears to glimpse a channel you don’t subscribe to on television–there are no stylesheets, it’s hard to navigate and interact with sites, and you get the message that this is not what the Kindle is for. If you want to read blogs on the Kindle, it’ll cost you. What’s that? Blogs are free? They are indeed–unless you want them via Whispernet. If you do, you can “subscribe” to them for a negligible sum of about .99 cents per month. Which adds up. A lot of major magazines offer subscriptions for this annual rate, or a little more. And oh, if you want those magazines (or several major newspapers) on your Kindle, because you just can’t wait until you get to the office to check the website or grab a copy from a paper box–well, that’ll cost you too. I don’t want to get into too much detail about the revenue models here, because that’s another post, but it’s important to note that among the bells & whistles Amazon doesn’t shove up front is the ability to transfer other files–either in Amazon’s proprietary .azw format for Kindle, or in PDF format–to your device. If you use the wireless Whispernet system, you’ll likely get dinged by Amazon. If you use your USB cable (included with the device) it’s free. Yes indeed, it is extremely fast and convenient to download a book from Amazon onto the Kindle. All Kindles come with OneClick purchasing enabled for your Amazon account, even if you didn’t set it up for yourself for regular online shopping. I bought my first book from Amazon in about ten seconds. It was fast, easy, painless…I never even felt that ten bucks leave my pocket. Next time: what about all those charges, and what about the fact that almost all book purchases for Kindle go through Amazon, and what about sharing/reselling your Kindle books, and what about that kid who got his copy of 1984 wiped from his Kindle last year? Also: I’m doing a lightning talk at Online Northwest on February 5, 2010, titled “Whither the Book?” This post is part of my general organization for that talk. 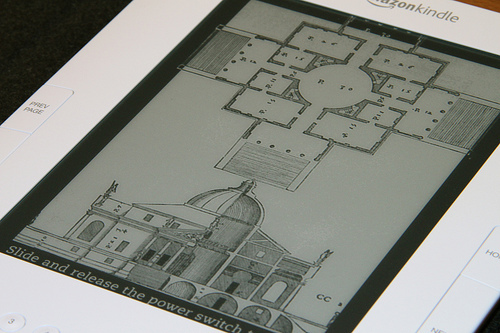 Image is Kindle 2: Electronic Paper Display by Yutaka Tsutsano. Flickr Creative Commons attribution license. It’s been a while since I’ve posted, but this seems like a fitting return to the blog. Cliff Landis, Technology Librarian at Valdosta State Library in Valdosta, GA, pledged to match aid donations to Haiti from his own savings–up to $10,000. He thought it would take a month and a half to get there. It took three days. Cliff’s video response to this is very much worth watching.